NACM is the largest professional certification association in the world for mediators. Through our numerous members, NACM provides certification examinations, training, continuing education, information about the industry, up-to-date news, programs to assist mediators in their work, training programs to assist candidates who want to break into the industry and initiatives to improve communication with the mediation field. 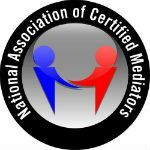 The National Association of Certified Mediators is committed to providing mediation information to both Mediation Professionals and alternative dispute resolution enthusiasts. Be committed ... Get certified here online. We are both nationally and internationally recognized. Want To Learn More About Our Certification?